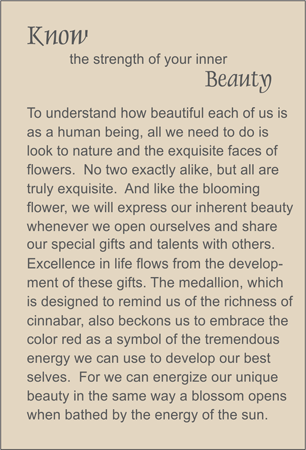 Cinnabar medallion showing the beauty of an open flower blossom. (Resin over wood, as authentic cinnabar is toxic.) Accented with black agate, replica of an ancient Chinese coin and black tassel. Instead of flowers that last only days, fill someone's days with a flower that will last forever.